Experience the untold chapter of Kyle Crane's story set in a vast region outside the city of Harran. Leave the urban area behind and explore a dangerous countryside packed with mysterious characters, deadly new weapons, and unexpected quests. Gain the trust of the locals and infiltrate a centuries-old cult that hides a dangerous secret. 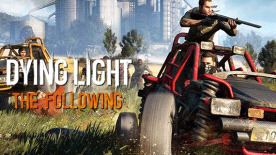 Take the wheel of a fully customizable dirt buggy, smear your tires with zombie blood, and experience Dying Light's creative brutality in high gear.